Scalenohedral crystals occur in both generations of calcite but are less common from the 2nd generation. Scalenohedrons from the 2nd generation have similar physical properties as the more complex crystals, but are generally much smaller. The photo to the left displays a 2nd generation scalenohedron. 1st generation crystals differ from the more complex crystals in several ways. 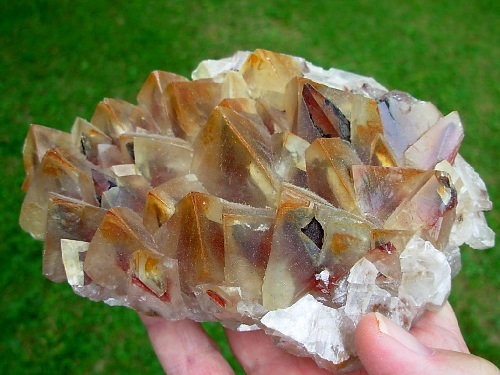 First, these crystals are always tan, yellow or brown. Second, these crystals tend to form clusters as displayed in the photo to the right. Also, 1st generation calcite is more likely to develop seams of small intergrown crystals, while seams of calcite created by the 2nd generation are often formed by a single large crystal which over grew its space. Lastly, these 1st generation crystals have no reaction to ultraviolet light. Radiating, fibrous sprays and crusts of snow white to cream colored aragonite are regularly found at the Monroeville locality. While individual crystals up to 3 millimeters have been observed, aragonite crystals are more commonly less than .5 millimeters in size. Often, but not always, the aragonite is found in association with and grown over partially dissolved calcite on later generations of ferroan dolomite. This may indicate that the development of the aragonite was made possible by the presence of calcite. Although these typically occur as extremely small, micro crystal clusters, the mineral’s presence is worth mention as this polymorph of calcite is rarely observed in the state. It should be noted that aragonite is regularly encountered at other Devonian age septaria occurrences in Ohio as well.